ACO manufacture three catch basins from polymer concrete. The excellent material properties of polymer concrete makes it an ideal material for these components. These units can be supplied in vinyl ester polymer concrete for improved chemical resistance. 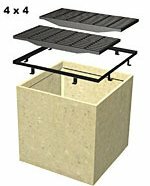 These basins can be used as part of a trench drain system or as stand-alone units. Call 800-277-5015 to place your order for Polymer Concrete Sumps!